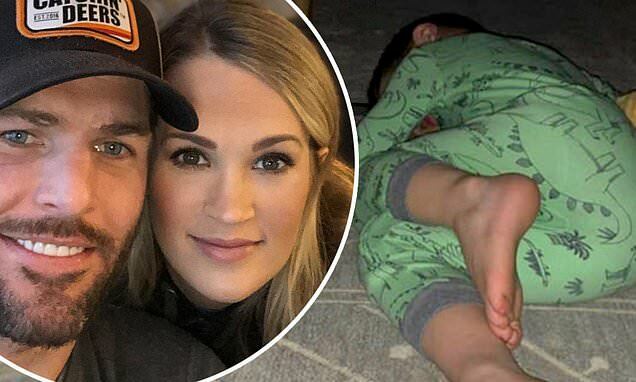 Carrie Underwood and Mike Fisher's eldest son is shaping up to be a bonafide Sherlock Holmes. Or not. The former professional ice hockey player, 38, posted a hilarious photo on Instagram of four-year-old son Isaiah hiding under the table as he did his best to spy on his family. Unfortunately for the child, he fell asleep. While Isaiah attempted to be sneaky, he didn't see his plan all the way through. Because instead of harrowing in on his investigator skills, the older brother of Jacob Bryan, two months, completely fell asleep in the process. In the Instagram story, Isaiah was caught underneath a side table in the couple's living room. He wore a green dinosaur onesie and looked to be sleeping peacefully as his dad grabbed a picture for some funny memories. Mike wrote, 'When you sneak out of bed to spy but fall asleep,' next to a crying laugh face emoji. Isaiah was cuddled up next to a yellow stuffed animal as he lay on the grey and cream rug. Fisher and the country singer said their vows in 2010. Fisher was born in Peterborough, Ontario, Canada, where he played junior hockey and ultimately with the Ottawa Senators of the National Hockey League (NHL).